My day time routine is far more scarier then my nighttime but I am sharing it anyway. My skin is pretty amazing though...here's how I keep it clean and wrinkle free. Except those three stupid wrinkles on my forehead that Pat won't let me get Botox to fix. I know it seems like a lot but it's all necessary. As a reminder I am 34 with combination skin, medium sized pores, and wrinkles just waiting to break free but I shall not let them! 1. 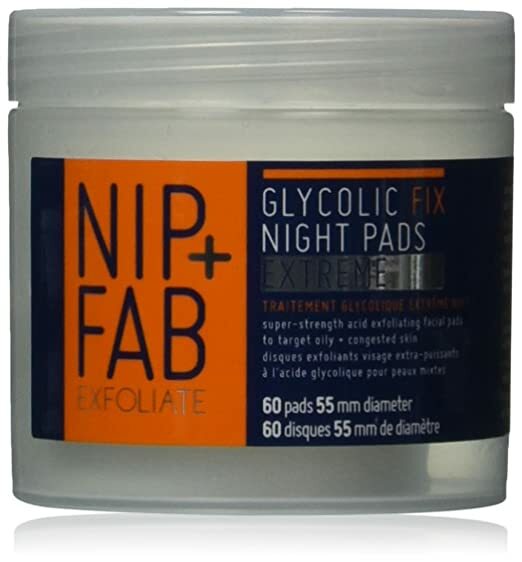 I hate soap so in the morning I wipe away the nighttime grime with Nip + Fab Glycolic Fix Nighttime Pads (which I've recently replaced Gylcolix Elite Pads which are both more expensive and can't be bought anywhere else but Amazon however they're 10% glycolic acid and the N+F are only 5%). They are full of exfoliating goodness and have salicylic acid with helps fight blemishes. Get a discount with a monthly subscription. P.S. Pat uses these too. 2. Once my face is clean I use Yes to Grapefruit Pore Perfecting Toner Spray, which I adore, the scent wakes me up and really refreshes and hydrates my skin. 3. Once my face is cleaned and toned I use Paula's Choice Skin Perfecting 2% BHA Liquid which is a bloody miracle product. Like most products I used I read about it at 2 am from a twitter post likely from InStyle. You can get a trial size for $10 and it is totally worth it. I will be giving one away on Instagram this week so check out @pinkhairfloosie for details. This product exfoliates, tones, fights blemishes, it really does it all and my makes my skin super tight (God I wish Sally Harper could try this) ask my husband I make him feel it after I put it on. 4. 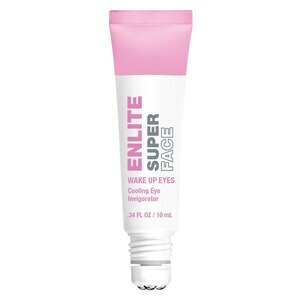 While the serum is drying I put on my eye gel Enlite Super Face Wake Up Eyes Cooling Eye Invigorator with it's cooling metal applicators and I pat it down to help kill those dark circles and morning puffiness. 5. Moisturizer time!!! I've switched this since this summer's post as well. My friend Amber Yoder is a Mary Kay rep and I bough the Time Wise Age-Fighting Moisturizer Sunscreen in the spring and only opened it recently because it's only SPF 30. Not strong enough for me in the summer but perfect for the winter and I absolutely love it. My skin is radiant with this moisturizer. 6. Facial oil is last, remember that awesome perfect facial oil I make? Well the rosehip oil makes it smell so I don't use it during the day. I only use oil on cold dry days and never in my t-zone. L'Oreal Paris Age Perfect Glow Renewal Facial Oil gets the job done to keep my skin from drying out in the harsh winter. A little goes a very long way. So just six little, minor, but EXTREMELY important steps! Stay young my friends.